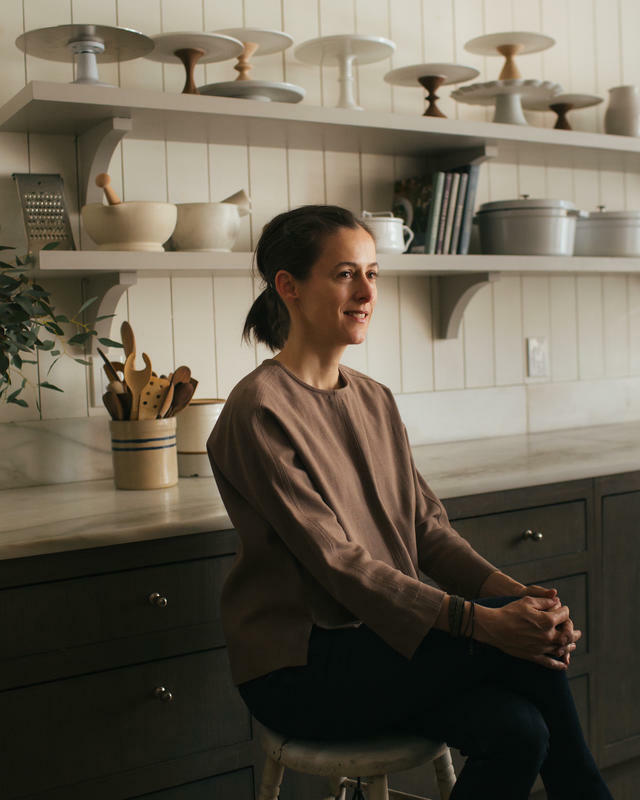 Amanda Hesser penned her first book at 24, wrote over 750 stories as a food reporter for The New York Times, and was the first to feature Ferran Adria of elBulli in a major U.S. publication. When it comes to storytelling, she’s precocious, prolific and at the forefront. So what was that seminal work that made content so compelling that it became central to her life and career? The Official Preppy Handbook. The young Hesser mistook the parody, which was a gift from her sister, for a guide to a lifestyle she aspired to have. She devoured the guide end to end. And that’s the impact of content that moves readers to action by engaging and informing them, over simply making the hard sell. 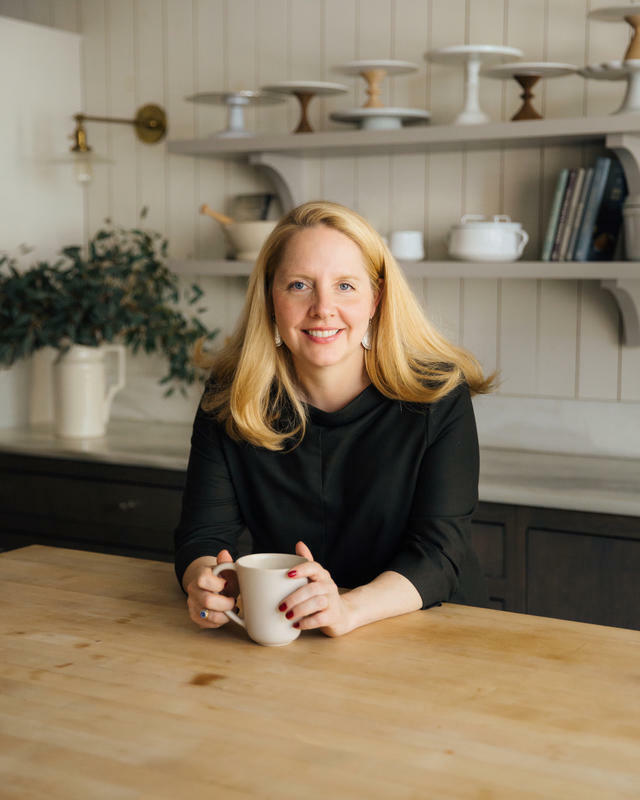 Today, Hesser and Merrill Stubbs, both trained cooks and food editors and writers, are co-founders of Food52, a home brand that combines recipes, articles and community-submitted content with a home goods shop of more than 2,000 items. The brand reaches 13 million people each month, and is growing like gangbusters, thanks in large part to its thriving online shop that makes up two-thirds of annual revenue. 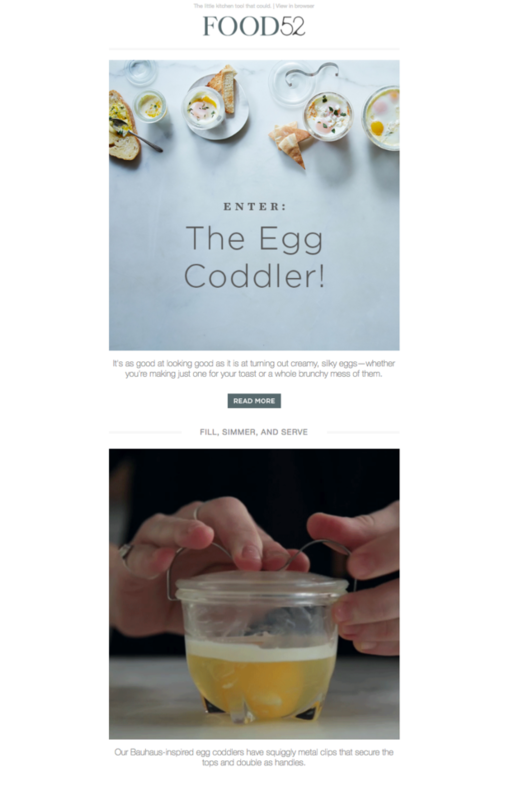 Still, when you land on the site, full of lush food photography and clever cooking techniques, you’d understandably assume it was simply an online magazine. In this exclusive interview, Hesser and Stubbs explain why they’ve always led with engaging content, confident that sales would follow. They walk us through their three most valuable channels — email, Instagram and video — with tips for maximizing each route to customers. And they share the no-to-low-cost content strategies that any founder can — and should — implement today. The interplay between content and commerce — like that between company and customer — must be bidirectional. What follows are three channels that Hesser and Stubbs have used to assert Food52’s brand personality as well as link and level up their content and commerce strategies. Food52 sees email not only as a distribution mechanism, but a vital and creative element of its business strategy. Emails aren’t dashed off as a means to an end, as a way to simply deliver links and generate clicks. Hesser and Stubbs want their emails to increase engagement, of course, but they’re committed to publishing valuable content, in this format like any other. Showcase what’s not in your shop. Interestingly, though the Wednesday email from Miglore isn’t focused on the Food52 shop (and often includes recommendations for products the shop doesn’t even carry), it drives as many sales as a commerce-focused email. “We do have related content at the bottom of every email — suggested products that are relevant to what Kristen's talking about. 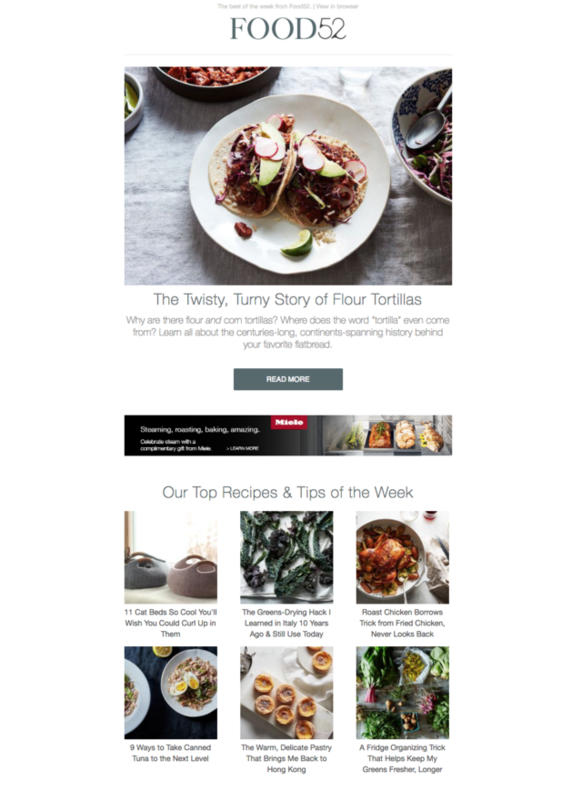 And even if products are included only as little thumbnails in the newsletter, the Genius Recipes email ends up generating anywhere from $3,000 and $9,000 in sales,” says Stubbs. It’s further proof of Food52’s core hypothesis: lead with high-quality content — offer value to your readers — and the sales will follow. Establish a feedback loop (a fancy way to say: read and act on replies to your emails). The takeaway? The best type of engagement is education done genuinely — to teach rather than aim to show the extent to which you’re an expert. Build your content strategy around educating your users by meeting those needs, and the insights you gain in return will be well worth the effort. Double-down on your sign-up flow. Hesser and Stubbs understand that Instagram is best suited for companies for which visuals and short videos are at the core of how they convey their business, such as Airbnb, Rolex or GoPro, but many of the following tactics also relevant across other social media channels. Too often trailblazers get lauded for being at the forefront and less celebrated for what’s left in their wake. Brands are only as good as the path they leave for others. For example, the team hit viral gold by amplifying the voice of their users. At the end of 2014, Food52 had 100,000 Instagram followers. That’s when they launched #f52grams. “Each week would have a particular theme, whether it was pink food or your best stew. People would Instagram using that hashtag and bring in their friends, and their friends would get to know us,” says Hesser. By 2015, Food52’s Instagram followers had ballooned to one million. Before hitting a million — or even 100,000 — followers, though, there was a lot of trial and error. It was an ongoing process of trying out pieces of content to see what garnered the most interest, while also pushing followers to dip their toes in the breadth of content Food52 offers. As Food52 nears two million Instagram followers, that spirit of experimentation continues to serve them well. Because when it comes to changeable, unpredictable social media formats, it turns out you can’t ever rest on your laurels.“The thing with Instagram — and pretty much any social media medium — is that you constantly have to be flexible and willing to experiment while not risking the relationship you've built with your existing audience,” says Hesser. Be data-guided — more than data-driven — on social. Wherever you can get data, stay close to it. “We do have an analytics team, but I would say that the social team probably handles 90 percent of the data analysis for social,” says Stubbs. Hesser adds, “We know from being in media for a long time that you need to evolve, even if the data is telling you to do the same thing over and over,” she says. And when it comes to knowing how and when to push the envelope, hiring the right social media pros is key. “They really do have to have that combo of being able to comfortably analyze data and having the sense of fun and innovation to put together an Instagram Story that’s in line with the brand, but also a little bit fun and quirky,” says Stubbs. And it works: Stories currently drive 50% of Food52’s Instagram revenue, and 30% of Instagram traffic to their site. “Obviously, producing Stories takes more resources and time and thought than a photography post, but we've found it definitely worthwhile,” says Hesser. Take Food52’s video for the Lazy Mary Tart, a fan favorite recipe since it won a contest in 2010. As easy as its name suggests, this recipe has just one tricky element: prepping the dough. So when it was time to produce the video, it was only logical to pair the tart with the shop’s Lovely Baking Rolling Pin Set. The result was a recipe video that organically incorporated product promotion, too. The success of that pairing was immediately evident: the video yielded 2,500 engagements on Facebook and sold 18 units, far above the company’s benchmarks for organic posts. Some of the best videos are solutions disguised as stories. Problem-solving becomes delightful with a bit of charm and cinematography. Videos are your brand personality in motion. To achieve that mission, Hesser and Stubbs still yea or nay every product and chime in on any major visual decisions for the site. But as the company has grown, they’ve taken steps to scale those aesthetic judgments, too. In the early days, they always worked with the same photographer, who later oversaw hiring new photographers and training them on the brand’s lighting and visual style. For many, the relationship between content and commerce is distant — or a loose correlation at best. But Food52 has found a way to connect them in a consistent way across a number of tools: email, social and video. First, take a page out of old media and reimagine your emails as magazines. Try different formats and curators to introduce variety without surprising your readers. Foster trust and some objectivity by linking to editorial posts instead of product pages, or feature products that your online shop may not even sell (yet). For social, elevate others to amplify your brand. Capitalize on every new feature on social to reach new customers and be data-guided — not data-driven — on your decisions. Lastly, use videos to tell your best stories and as your highest-leverage tool to illustrate your brand personality in motion.